With care, a willow basket can last a lifetime. However, sometimes they are damaged. 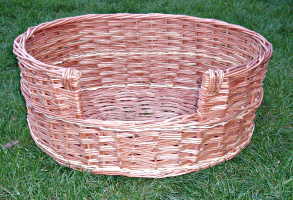 I can repair many willow baskets as you will see here. 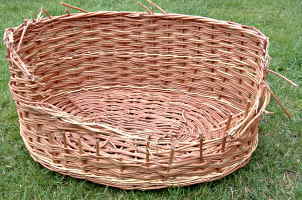 If you have a basket which needs repair, let me know what your requirement is. A common repair that I've made on many occasions is to replace the handles of cheap shopping baskets. My shopping basket handles are anchored properly and don't fall out. 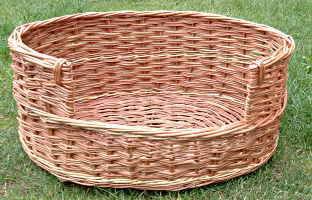 If you need a repair or reproduction basket please contact me. 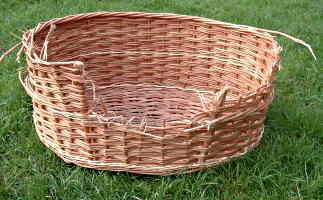 Most dogs don't chew their baskets to any significant extent. Ours never has. However, some do. One way of trying to stop them is by spreading something unpleasant tasting, such as English mustard, on the parts that they chew. This basket was made by me originally but returned in the state above left after a few weeks. I repaired it as shown above right, recommended mustard, and thought that was the end of that. Next year, the same basket came back to me in the state shown below and left. I repaired it a second time, this time not quite into the same shape as original, and hope that the dog will now chew something else ! This customer brought the rather elderly and broken log basket basket on the left in for repair, but unfortunately the basket was too damaged to fix. I made the reproduction on the right. When baskets are as damaged as this it's time for a replacement instead of repair. However, ask me about your damaged basket and I will let you know how likely it is that I can repair it. 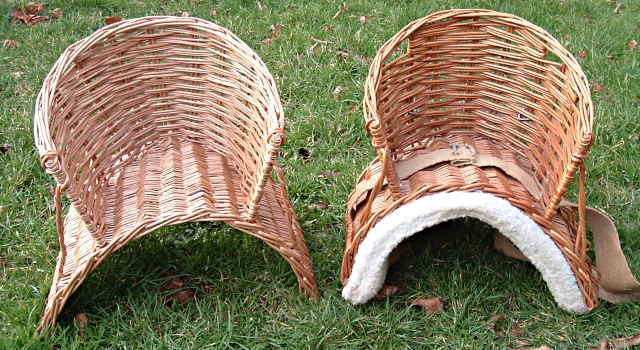 The child's basket saddle on the right is another basket which was brought in for repair. In this case it looks OK in the photo but it has woodworm and is falling apart. I made the duplicate on the left. A reproduction butchers bike basket to replace the rather worn out basket on the left. I have made many reproduction baskets for old bicycles and if you have a bike which needs a special basket I can make one for your bike too. 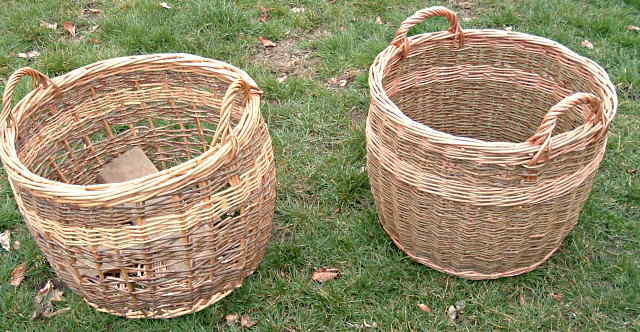 I also have a web page showing reproduction bicycle baskets.